A Cry for Help from the Forest. My eyes take in the beauty of the trees behind my house, only to notice that the giant oak tree living there is losing it’s leaves … in August. This shouldn’t happen until October. Something is wrong, but I push the thought away. I don’t want to believe it. 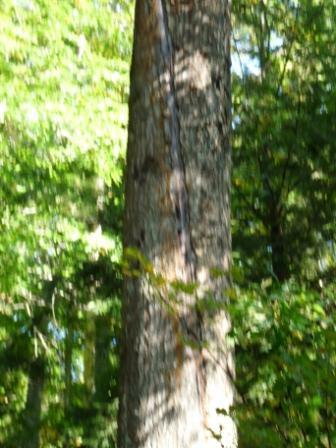 That fall, I ask my “tree guy”, J.P.. to come by and look at the tree. He shows me where it was struck by lightening. J.P and I discussed taking down the huge tree. We both assumed the tree was dead. J.P. agreed and said he’d get back to me in a few weeks, but as autumn continued, he was busy and I was busy, and so the tree remained untouched. I watched the trees in my back-yard forest begin to grow leaves and somehow, deep in my heart, I expected the Oak Tree, too, to produce leaves. It didn’t. I felt disappointed. Still, I held off calling J.P. to come back, as life had brought me many other challenges that required my attention and finances. All summer long, I keep watch on the Oak Tree. I didn’t want to take it down. I wanted it to be alive, but my analytical self said the tree must be dead. 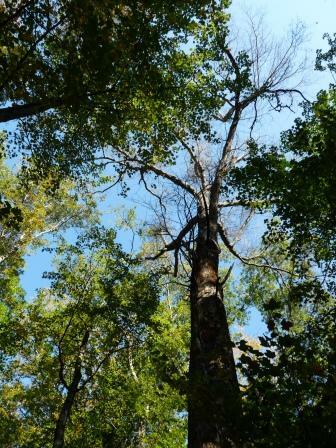 This tree is huge, more than 60 feet tall, and the canopy is also huge. If it should fall towards the house in a storm, other trees would be damaged and it would hit the house. If it fell in any other direction, other trees would be hurt. Still, I waited. I couldn’t seem to get myself to move forward on this. I didn’t know why I was holding back. One day, I prayed to the Nature Spirits to take care of removing the tree. I let the whole thing go for awhile. 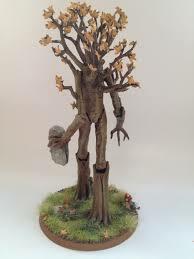 I contacted J.P. a few weeks ago, and he agreed to come take care of the tree. J.P. climbs trees like the old-time tree cutters. He’s newly retired from his day job, and to save his back, he’s bought a machine with will lift him most of the way up a very tall tree. 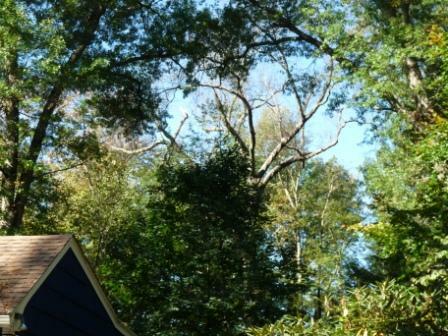 Yesterday, October 16, J.P was supposed to come to take down the oak tree canopy. At 10:30 a.m., I returned from a dental appointment, and there sat J.P.’s machine. The tree looked untouched. No sign of J.P. or the fellow who helps him. At 3:30 p.m., I left for an evening program. Still no word from J.P. Arriving home at 8 p.m. I found a message on my answering machine from J.P.
Nedda, I tried to work on the tree, but I kept feeling that I would be injured or killed if I did so. In 40 years of doing tree work, I never felt anything like this. So I figured I might need to climb the tree instead of using the lift. I decided to come back tomorrow morning and climb the tree. So tried to take off one branch that would make the climb easier, but my chain saw with a new, sharp blade, gave off sparks and the branch refused to be cut. I’ve never had that happen before. Maybe if I climb the tree tomorrow I can do the job for you. This confirms what I’ve been feeling off and on all summer long … that I shouldn’t have you take down this tree … that maybe it’s still alive, or if it’s not, the nature spirits will take care of it coming down … that maybe it will still grow some leaves. But with all the terrible storms and high winds that come through here, my fear motivated me to have you come and take down the canopy. Now, I feel justified not only in waiting, but in exploring this whole matter more deeply with the tree itself. J.P. was relieved that I wasn’t complaining about him not doing the job. He was grateful that I understood how he had felt, although was surprised by what I told him.. I was relieved that J.P. had given me confirmation of my own feelings about the tree. Tomorrow morning, when I sit for meditation, I’m going to call in all the nature spirits and find out what’s going on. When you get here to pick up your machine, I’ll have more information for you. 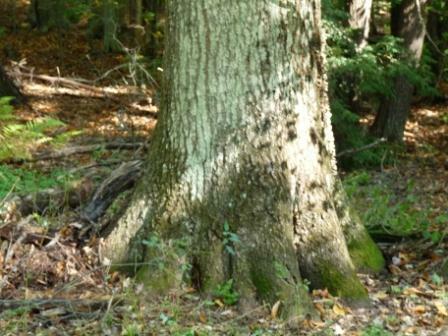 The base of the Oak’s trunk. Look at all those roots. At 6 a.m. this morning, there was just enough daylight for me to go into the woods safely (avoiding bears and other wildlife) to see what I could feel from the tree while in it’s presence. I put my hands against the trunk and tuned in. Immediately, I could feel the tree’s life force. It was, indeed, alive. Returning to the house, I sat down with my journal and called in everyone who might have information or creative ideas or energies and healing skills to offer. It felt appropriate to call in all of the beings listed below. 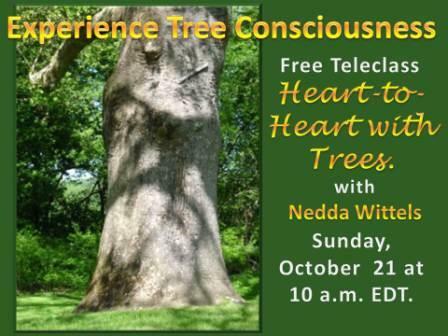 The tree is so huge, I knew I’d need a lot of help to hold the energies to make a shift. Well, that tree definitely had a bigger aura than I have, so called in all the assistance I could find. The Overlighting Deva of my property. The Overlighting Deva of my street and of the town in which I live. Pan, the being who is responsible for all the nature spirits. The Elemental Spirits of Earth, Wind, Fire, Water, and Ether. MAP (Masters’ Medical Assistance Program) healers who are experts in healing trees. The Spirit of Standing Ones (trees) and of the Oak Trees in particular. The Ent (tree shepherds) of the Oaks. 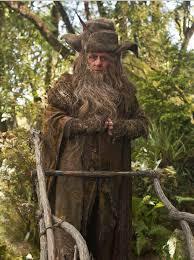 Radagast showed me how to pull the energy of the lightning from the injured tree spirit. Gurumayi (Swami Chidvilasanda), my guru. Amma Karunamayi (incarnation of the Divine Mother living on earth right now). Spirit of the Red Wood Forests, some of the oldest and wisest trees on the planet. I opened myself to receive a message, and got very strong, very emphatic replies in a very powerful voice that seemed to be more than one speaker. The Oak Tree must remain. Key to balance and harmony in these small woods. 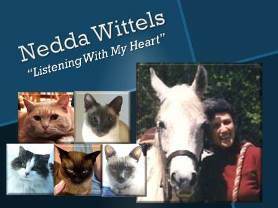 Honored teacher and friend, wisest of the wise. We beseech you to leave this tree alone. It wants to live. It still lives. It is deeply wounded. It struggles to heal. It must be helped. YOU can help it. You MUST help it. We will guide you and teach you what to do. We are the voices of the Forest speaking in chorus. We are all the trees, even beyond this small patch of remaining forest. Too weak; too ill to speak with you. We ask on it’s behalf. So of course, I agreed to help. Here are the general instructions I received. Open a vortex on your property to receive and transmute all energies removed from the tree. Use the large quartz crystal on my alter to siphon off the energy of the lightening strike from the injured Tree Spirit. Use grounding stones in my pockets to ground me so that the powerful healing energies that must pass through me will not weaken or imbalance me. Pour structured water that has been programmed for gentleness, self-love, and healing at the base of the tree. Place the flower petals and liquid offerings from the puja (Indian ceremony) you attended last night to bring the energies of the Divine Mother to the tree for healing. Place a rose quartz crystal (which I had just found in a drawer the day before and put on my alter) at the base of the tree. Once you begin the healing, you will be guided in each step. To complete the healing, male and female chi will have to be balanced. You need a strong, male who loves trees to assist you. Ask J.P. to do it. After writing down all the instructions, I traveled energetically into the tree, into the taproot where the tree spirit lives in the winter. It was very ill, very uncomfortable, and in pain. Then I followed instructions for healing. When J.P. arrived, I was ready to complete the healing. J.P. agreed to help. He and I stood on opposite sides of the tree trunk. I asked him to put his arms around the tree and his full body against it, as I was doing on the other side. We both stood there for about 10 minutes, intending that our life force would enter the tree to balance it’s male/female energies. I saw in my mind’s eye that our energies met, intertwined, and then spread upwards to the very top of the tree and down to the tree spirit resting in the taproot. When we finished, I asked J.P. to share anything he felt comfortable telling me. I smiled, thanked him, and we hugged. “I’ll let you know how the tree is in the spring,” I told him. “I fully expect to see leaves sprout.” We both smiled. inspired by this true story. 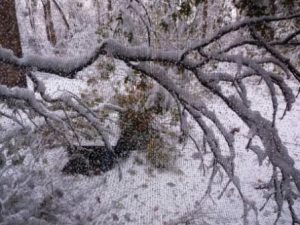 After the devastating storm of October 30, 2011, many trees were damaged, to put it mildly. Yesterday, the tree service man who takes care of my trees, JP, came to take down two very large oak trees standing within 4 feet of the corner of my house. These two trees stood so close to each other that their roots are totally intertwined. This means that if one comes down, they both have to come down because the remaining tree would be unstable. JP is a very tall, very handsome man who climbs trees to do his work. No big equipment for him. JP communicates with trees. He feels their energy. He allows himself to be guided by their messages to him. The day before JP was to come here, I did a sacred ceremony in my back yard. I called in Mother Earth, Father Sun, the 4 directions, my personal guides, Pan, the Overlighting Deva of the property, the standing ones (trees), and all the other Earth Kingdoms. I asked permission to remove the trees and offered tobacco that I had prayed over. When I finished, I touched each of the trees that were to be cut down and said my goodbyes. The next morning, I went back to the two trees and placed a bit of holy water on each tree’s trunk. When I touched one tree, it’s energy felt cold by comparison to the energy of the other tree. Actually, both trees felt different to my touch from the day before. Both felt less alive – as if the life force of one was gone and of the other, the larger one, was nearly gone. JP arrived with his helper and got to work around 9 a.m. He told me they were going to quit at noon and finish up during the coming week. So around 11:45 I went outside to see what was happening. Sure enough. JP showed me how the tree where the energy had felt cold was already wet and rotting from the damage last fall, as water had gotten into it. JP was amazed. I was, too, but I also knew that I had asked all the beings to assist in this process, to make it safe for the men who would be doing it, and to help the spirits of the trees who were leaving. After JP and his helper finish up on Tuesday, I’ll go outside, do another ceremony, and request assistance to rebalance the yard. All is in Divine Harmony when we work with Nature.